In a turn of events that could have aired on TV as Hoarders: Bee Edition, 45 beehives hosting 3 million bees were seized last week from a home in Corona, Queens. Bees have been generating quite a buzz this summer by occupying fire-hydrants and delaying flights but this time, it’s the beekeeper that’s making the headlines. After neighbors and police felt that Yi Gin Chen’s “hobby” had gone overboard, a large scale bee-removal operation was put into effect to remove the hives from the area. 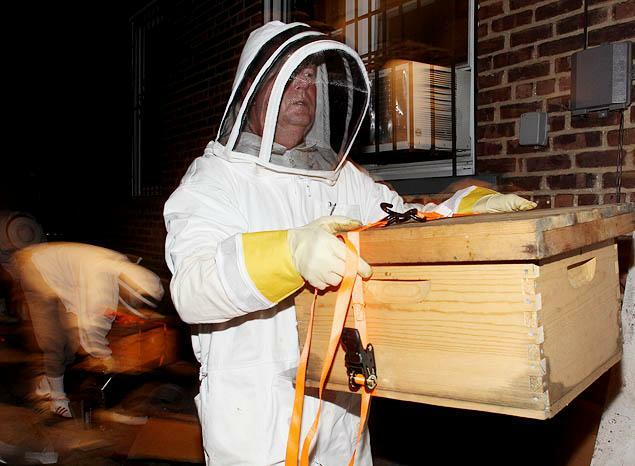 New York City legalized beekeeping in March of 2010, but if a resident wants to host hives, they must register them with the city (or face fines of up to $2,000 each). According to Andrew Cote, president of the New York City Beekeepers Association, only about 200 hives have been registered. To put that in perspective, Chen was holding nearly ¼ the amount of registered bees in all of New York in his own backyard! Chen insists he wasn’t keeping the millions of bees to make honey profit, explaining that he used to be a beekeeper In mainland China, and that’s “all he meant to do” in Queens.